My interview on RFI (Radio France International) by Mr. William Niba, concerning the recent acquittal of Mr. Vaxevanis, freedom of the Press in Greece and the Lagarde list affair. The press abroad is starting to realize exactly how serious the issue of freedom of the Press has become in Greece. The influence of the journals is enormous; even the waiters in the cafés and domestic servants have their favourite newspaper, and discourse fluently on the political problems of the day. Needless to say, very little has changed from 100 years ago. There are no “domestic servants” anymore, but otherwise the newspapers remain extraordinarily numerous. It is worth noting that several newspapers appeared even during these last 5 years of recession. Much of the national energy is wasted by this continued political fever; it is diverted from practical aims, and may be said to evaporate in words. Questioning authority is a sign of a healthy mindset, but it can become a vice if it only remains on a theoretical level. The majority of the Greek people today is questioning the corrupt political system, but at the same time it is fearful of change. Thus it kept on voting for the same two parties over the last 40 years. By “change” I do not mean simply voting for a left-wing party such as SYRIZA, members of which doubt its own ability to govern. I am referring to a radical change of the political scenery, in the example set by Iceland. A much smaller country, certainly, and with more practically-minded citizens, as far as politics go, than us Greeks. Still, it has become abundantly clear in the last few weeks, with the Lagarde list fiasco and the arrests of prominent journalists, that the current political system is unwilling and unable to affect any kind of meaningful change, even to the detriment of the people it is sworn to serve. The state crackdown on public protests, as has been demonstrated in the past couple of years, with riot police making wanton and indiscriminate use of tear gas and violence, against journalists, elderly citizens, even children, has now been escalated to a crackdown on the minority of the Press in Greece which is still exercising its right (and obligation) of free speech. Mr. Vaxevanis was arrested last week, ironically on the day of our national holiday celebrating our resistance against the Axis during WWII, on charges of breach of privacy. That was less than 24 hours after his magazine, Hot Doc., published the names of 2000 Greeks holding accounts in the Swiss branch of the HSBC bank. Those names are contained in the now infamous Lagarde list, which was handed on 2010 by Mme Lagarde to the Greek Minister of Finance at the time, Mr. Papakonstantinou. Two years later, Mr. Papakonstantinou and Mr. Venizelos who succeeded him, trade allegations concerning the disposition of said list and plead ignorance on its current whereabouts. Despite the international fiasco, they were not charged in any way by the appointed Committee of the Parliament who was called to examine them. On the contrary, the journalist who chose to publicize the contents of the list was arrested within 24 hours. Another journalist, Mr. Karatzaferis, was arrested using a years old warrant from a closed case, within a few hours after he stated on his TV show that he intended to publicize documents stolen by the hacktivist group Anonymous from the Greek Ministry of Finance. He implied that these documents prove how Mr. Papandreou as Prime Minister and Mr. Papakonstantinou as Minister of Finance engineered the debt crisis and drove the country into the hands of the IMF. 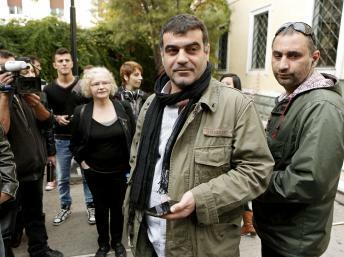 Mr. Karatzaferis, who was arrested just hours after his show, was released the very next day and was hospitalized. He stated that he would go forward with his promise and start publicizing the documents immediately. Two other journalists, working for the national television network NET, had their morning show cut because of the comments they made regarding the Minister of Public Order, Mr. Dendias. Mr. Dendias had firmly denied allegations of anti-fascist protesters about being tortured by the Police, and predicted that the medical examiner’s report would show no signs of mistreatment. He also proceeded to threaten The Guardian with legal action because it publicized these allegations. The reports of 8 separate medical examiners verified the allegations, sparking the comment of the two journalists who wondered what would happen now with Mr. Dendias’ threat against The Guardian. They softened the blow by adding how they always thought that he was a serious man. Regardless, even this mild comment was enough to send the two journalists home. They were being too kind. Mr. Dendias has not only let the neo-Nazi Golden Dawn party thugs roam the streets assaulting people with impunity, but also grossly overstepped his authority. A Minister publicly anticipating the results of an examination carried out by independent public servants, thus practically dictating the result to them, is something which would be considered appropriate only under a totalitarian regime. No, Mr. Dendias is not a serious man and neither are any members of the government, people who have been toying with the fortunes of an entire people for so long and with such arrogance, that they have now become exposed internationally. A mere two weeks before the US national election, the New York Times devoted their editorial to the shameful state of the Greek democracy. It is a sad day when citizens are forced to turn to foreign media or small, independent blogs for a shred of truth regarding what is truly going on in their own country. Sadly, the majority of the newspaper and television networks owners have close ties to the ruling and financial elite and often depend on them. There is no privately owned TV network in Greece with a permanent licence. This means that their operation could be suspended at any time by the government. The crisis has put an ever tighter noose around the collective neck of the Press, as journalists now fear for their jobs more than ever before. The question is whether this crackdown is a last-ditch attempt of a failing system to remain in control or if it is just a fireworks display aiming to divert attention from the latest batch of brutal austerity measures which are about to be approved by the Greek Parliament. It looks like that the Greek government, in cooperation with the troika, is trying to buy time until after the U.S. elections. The message I am reading is that any developments, not only here but also in the Middle East, have been put on hold until after November 6th. It might be one and the same; with attacks against foreigners, arrests of citizens due to exercising their right of free speech over the Internet, attempts to silence the Press and brutal police suppression of public protests, it is becoming increasingly hard these days to distinguish a totalitarian Middle Eastern country from a democratic European one.